The folks at the University of Pennsylvania's GRASP lab have done some amazing things with robots. They've made quadrotors that can swarm, ones that can play the theme from the James Bond movies, even ones that work together to build things. What's next? How about robotic boats? UPenn professors Vijay Kumar and Mark Yim have teamed up with researchers at DARPA to design and build a team of robotic boats that, much like GRASP's quadrotors, can swarm and work together to complete various tasks. 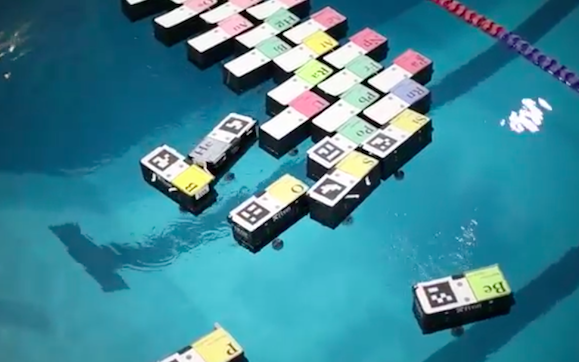 The fleet of 100 18-inch-long scale-model aquatic automatons are programmed to carry out tasks mostly autonomously: Human operators tell the robotic fleet what formation to take, but the robots figure out how to go about it themselves. According to UPenn, each robot boat has a unique "visual identifier that can be read by a camera, much like a QR code." This setup allows each robot to know where its fellow robots are in relation to one another. The researchers say that "in the open ocean with no cameras overhead, the full-size boats will use GPS for their location information." We joke a lot about robots becoming self-aware and taking over the planet, but in this case, DARPA and UPenn see their ro-boats (forgive the terrible pun) to be used for good. According to the research team, robotic boats like these could one day be used to help in recovery and cleanup efforts after a disaster, or assist in humanitarian operations. You can learn more about this system on the UPenn and DARPA sites. Airborne bots? Aquatic bots? What's next?